Okay, I realize it seems a bit late/early to be talking about Christmas stockings. After all, we just entered March. Why, you may ask, have I gotten into the jolly holiday spirit so soon, or late, depending on how you want to look at it? 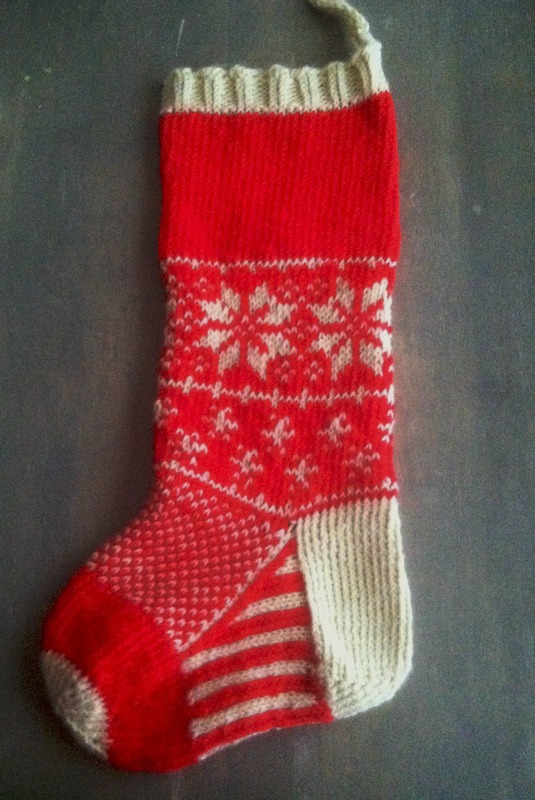 Last December, I realized my husband had no Christmas stocking of his own. The year before, our first Christmas as a married couple, we went to Target and bought him a nice, velvet one. Okay, not nice. I bought him the absolute biggest one I could find as part of a gag gift. It worked wonderfully for that, but he needed a proper one. See, my Grandmother spoiled us from the get-go. When we (my two brothers and I) were tiny little things, she knit us stockings. Mine is super petite, but darling. My younger brother’s is absolutely huge (Grandma blamed not checking her gauge on that one), and the youngest’s is just right. Sounds like a Goldilocks and the Tree Bears kind of set-up. Since her stockings are so special and made from love, I’ve not really liked store-bought stockings. It’s all her fault, really. So, December, with only three weeks to go until Christmas, I set out to do the impossible: learn not only how to knit in the round, but also color work and sock construction. 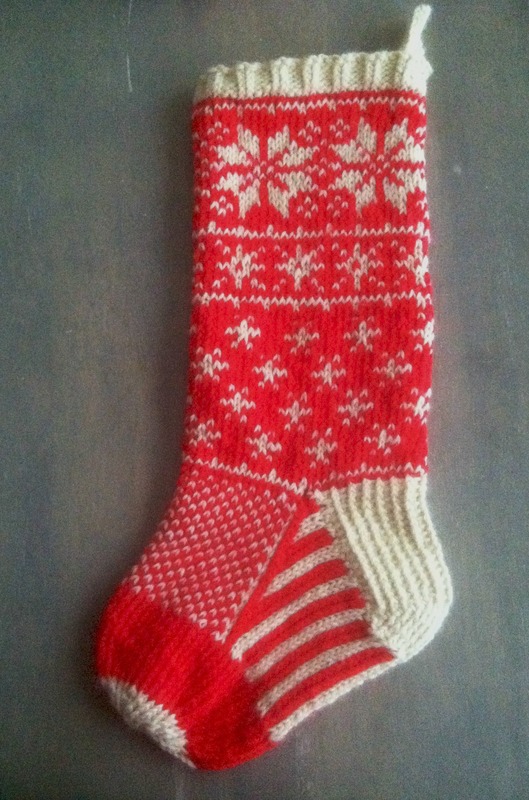 I used the Falling Snow Stocking pattern by Jennifer Hoel. I felt like tearing my hair out on several different occasions, including that darn heel. When I finished, I was absolutely stunned. It’s not the most gorgeous thing in the world, but it was my first stocking, sock, in-the-round, and color work project. Of course, after that, I had to do my own. 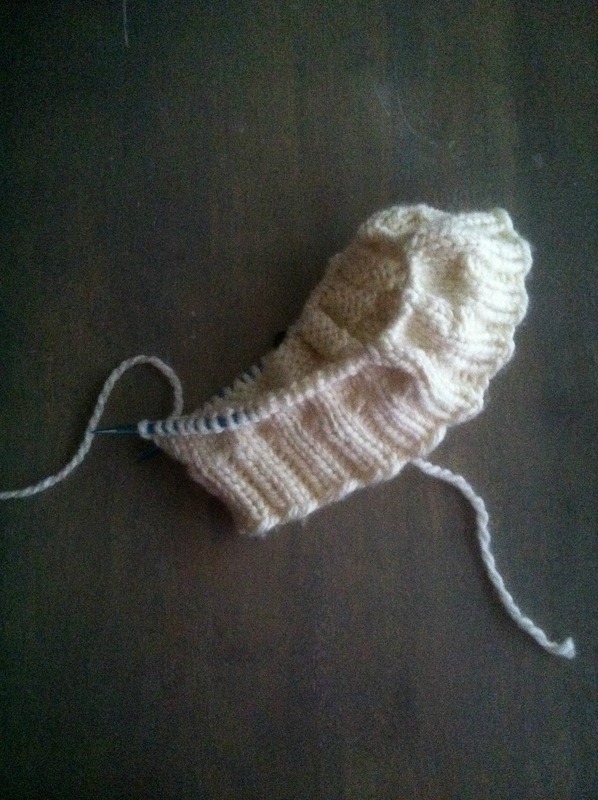 If you look at the original pattern, you’ll see I kind of wussed out on a couple of elements on the first stocking. The main being I do not have all of the snowflakes. I did go back and add more snowflakes to mine (plus, then we can tell the difference between the two without me having to stitch anyone’s name on anything), but I stuck with the ribbed top. What can I say? I like k2p2 a lot. Note, these have not been blocked. They should’ve been blocked ages ago, but this was before I knew to do that. I’m sure I’ll get around to it someday. Anyway, my mom really liked my stockings, and since Grandma’s are starting to fall apart from kids’ tugging at them every year, she asked me to make one for each member of the family. That’s 4 stockings. Then, husband mentioned I might have some nieces and a nephew who would like to have their very own stockings, too. That brings the number up to 7. So, I’ve cast-on for a stocking blank. Basically, I’m knitting up a completely blank stocking in the yarn type I’m probably going to use so I can see what size and gauge I want to work with. Then, husband and I are going to sit down and design 7 stockings and transfer the color work elements to graph paper. Then, off to the knitting. Do these count as socks? Hm, I wonder.